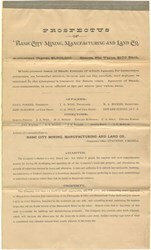 Prospectus from the Basic City Mining, Manufacturing Land Company . This historic document was printed by Valley Virginian Print Company. The Basic City Mining, Manufacturing, and Land Company was organized and designed so that Basic City would become the “little Pittsburgh” of the Shenandoah Valley. Due to the many boom and bust cycles that occurred in the late 1800s and early 1900s, Basic City never became the success that it was designed to become. Early Basic City/Waynesboro sported many industries including a pencil factory, furniture manufacturers, an automotive plant, vinegar plant, stove factory, and supporting industry for the railroad – which boasted a major intersection of north/south and east/west lines.